Avi Vantage delivers multi-cloud application services including a Software Load Balancer, Intelligent Web Application Firewall (iWAF) and Elastic Service Mesh. The Avi Vantage Platform helps ensure a fast, scalable, and secure application experience. 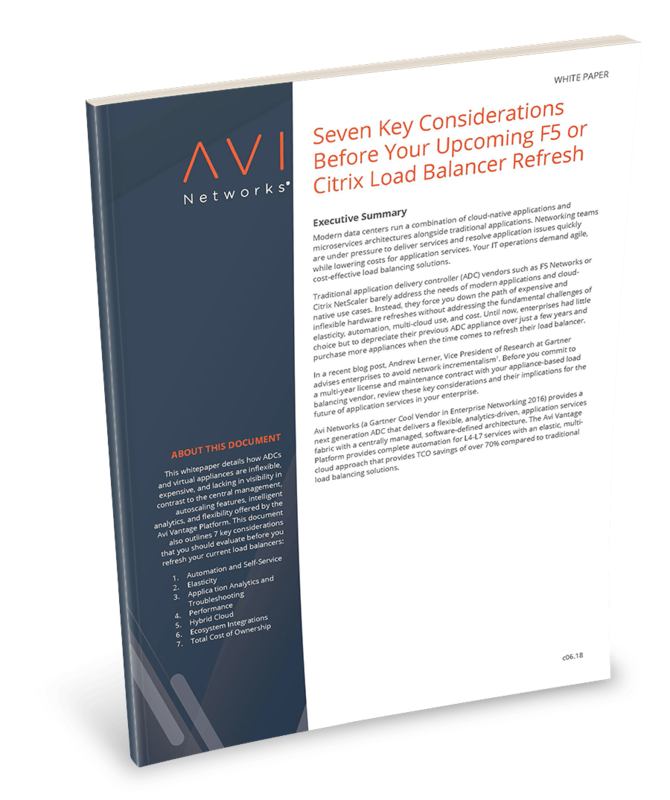 Before you commit to a multi-year license and maintenance contract with your appliance-based load balancing vendor, review these key considerations and expand load balancing services into full-featured application services. The software-defined, scale-out architecture of Avi Vantage provides on-demand autoscaling of elastic load balancers. The distributed software load balancers and the backend applications can scale up or down in response to real-time traffic monitoring. Application load balancing becomes more adaptable and intelligent. Take advantage of the load balancers’ privileged location (in the path of application traffic) in the data center by gathering useful insights from real-time telemetry collected from distributed service delivery components. Match the continuous application delivery goals and DevOps principles of modern enterprises by automating routine tasks such as virtual IP (VIP) provisioning and configuration changes. Swisslos’ lottery application was supported by appliance-based load balancers that lacked elasticity, and scalability. Poor load balancing performance impacted their ability to deliver a great end user experience. Switching to Avi’s software defined load balancer allowed Swisslos one-click deployment, elastic scale, automation and app analytics. This resulted in reduced app troubleshooting time and operational savings of 60%.